9 the topology of the structure is such that a large number of dissipative zones are activated. Fig. 6.6. In K bracings, collapse corresponds to buckling of one diagonal frames with eccentric bracings can also be designed to develop a large number of such hinges (q between 4 and 8). • Diagonals in tension can be very dissipative; frames with concentric bracings can be designed such that many diagonals in tension are activated as dissipative 'links' (q = 4) and a global mechanism is formed. • Panels in shear are very dissipative local mechanisms; frames with eccentric bracings can be designed to develop a large number of these sheared panels (q between 4 and 8). • Moment-resisting frames in which fewer plastic hinges can form are less dissipative; this is the case for 'inverted-pendulum'-type structural systems (q between 2 and 2.2). 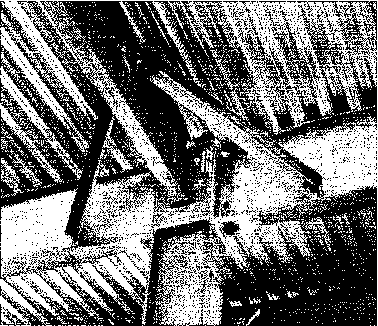 • Structures which require the contribution of elements subject to buckling for their stability, such as V bracings, are less dissipative (q = 2 or 2.5), but still possess some ductility if the design of beams is made assuming that they are not supported on bracings for carrying the gravity loads (Fig. 6.5). It should be noted that concentric V bracings are close to certain types of eccentric V bracings in their shape and stiffness, but the q factors of these two topologies differ significantly. The designer in search of both stiffness and a high q factor can benefit from this observation. 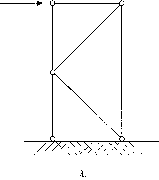 • Frames with K bracings cannot be considered as dissipative at all, because once a diagonal has buckled, the frame becomes a portal frame with a plastic hinge at mid-height of a column, which is an unstable structure (Fig. 6.6).